A Crisis Nursery staff member helps a little boy put on a Spiderman costume during playtime at the nursery. Do you need 24-hour crisis child care, a referral or help? Call our 24-Hour Helpline at (773) 205-3637. 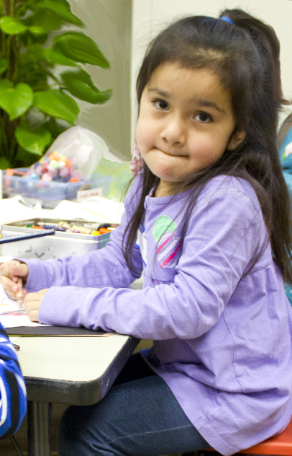 The Maryville Crisis Nursery provides free short-term care for children of families who are experiencing a severe disruptive crisis or a family emergency or to prevent that crisis from happening. Children ages newborn through six years receive round-the-clock childcare, up to 72 hours a stay. This safe and nurturing environment is designed to protect them from harmful experiences and the damaging effects of trauma. Issues that bring families to the Maryville Crisis Nursery include unemployment, parental illness or hospitalization, poverty and homelessness. Referrals to community resources for medical care, housing, employment assistance, job training, education, substance abuse treatment and domestic violence prevention. PLEASE SUPPORT THE WORK OF THE CRISIS NURSERY with a DONATION. Program Director • Amy Kendal-Lynch, M.S.